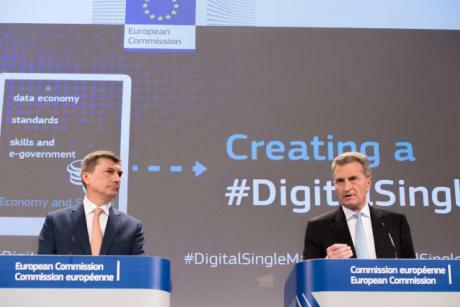 On Wednesday (6 May) the Commission presented its plans for the creation of a Digital Single Market. The plan, a priority for the EU executive over the next few years, is intended to ensure Europe does not fall behind internationally in the internet age. The strategy encompasses 16 central measures to be implemented by the end of 2016. It is meant to help citizens save €11.7 billion annually and is built on three pillars. According to the Commission, a Digital Single Market could “contribute €415 billion annually to our economic performance and create hundreds of thousands of new jobs”. EU Digital Commissioner Günther Oettinger indicated that Europe is in a race to catch up with US companies in particular. The “prevention of unjustified geo-blocking” is one of the digital strategy’s main points. “95% of Europeans have been prevented from visiting a website from another EU country or (have) been redirected to a different site with higher prices,” Ansip said. “We know this is a problem and we must find a solution for this,” he pointed out. Instead of doing away with the discriminatory practice of geo-blocking, the Commission’s plans are only equivalent to “roaming for Netflix”, said Julia Reda, an MEP from the Pirate Party. “Often, when people come across an error message on the internet saying, ‘this video is not available in your country’, it concerns works that are financed by advertising or public funds,” she explained. But because the concrete measures in the strategy paper only apply to paid content, geo-blocking will remain an everyday nuisance for Europeans, Reda said. Ansip had previously spoken in favour of quickly eliminating geo-blocking, but his words were met with opposition from Oettinger. In March, Ansip declared that he hated geo-blocking, upon which Oettinger responded, “I hate my alarm clock at five in the morning”. At Wednesday’s presentation of the strategy Oettinger referred to the “outstandingly internally structured” and “largely friction free” cooperation within the Commission. By the end of 2015, the Commission hopes to submit legislative proposals for a “modern European copyright law”. The goal is “to reduce the differences between the national copyright systems and provide comprehensive online access to protected works for users across the EU”. According to Oettinger, the Commission is seeking a “balance” between the interests of users and those of creators such as composers, filmmakers, journalists or video game developers. Changes are also planned for requirements in the telecommunication sector to create EU criteria for the distribution of frequencies at a national level, and equal starting conditions for all market participants. Providers such as Deutsche Telekom are choking new modes of communication, such as WhatsApp or Skype. In its aim for a single EU digital market, the Commission is also examining the market power of US online platforms like Facebook and Google. Above and beyond competition law, a lack of transparency in search results, the price policy or the use of data is expected to be investigated. As it announced in March, the Commission also began an antitrust investigation of cross-border online trade by corporations like the US company Amazon. A separate procedure is currently underway against Google which could end in a fine in the billions for the US internet giant. The project team for the Digital Single Market hopes to provide the results of the individual measures by the end of 2016. With support from the European Parliament and the Council, the Digital Single Market is supposed to be completed as soon as possible, and will be on the agenda for the meeting of the European Council on 25/26 June.